These stunning 18 Karat White Gold , 0.20 Carat total weight. Diamond Round 4-Claw Studs are the perfect way to inject elements of high impact style into your jewellery box.Featuring sparkling diamonds and a white gold finish, these beautifully crafted stud earrings are the epitome of everyday, wearable design that never fails to make a lasting impact. 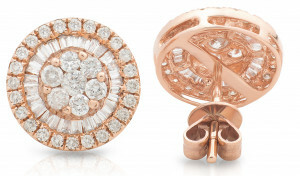 Classically feminine, these double-halo diamond stud earrings in polished 18k rose gold add allure to any look, accented with a subtle 18k rose gold glow. 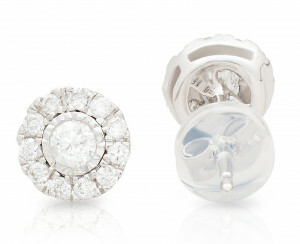 This classic pair of 18 karat white gold diamond studs are timeless and elegant. Each round cut diamond is 0.10 carat for a total of 0.20 carat set in four prongs for an elegant finish. These delicate invisible set diamond studs boast fourteen diamonds totalling 0.30 carat. 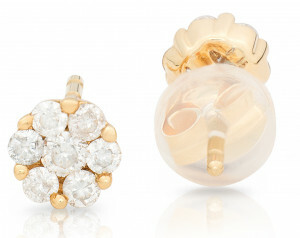 The beautiful stud set in 18 karat yellow gold includes a secure friction backing. These delicate invisible set diamond studs boast fourteen diamonds totalling 0.30 carat. 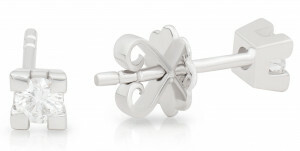 The beautiful stud set in 18 karat white gold includes a secure friction backing. 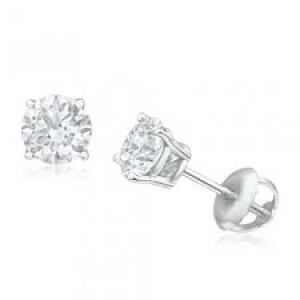 These delicate pave set diamond studs boast eighteen diamonds totalling 0.30 carat. 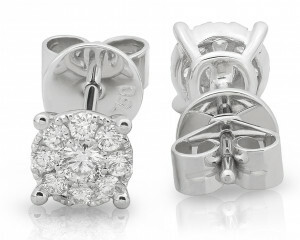 The beautiful stud set in 18 karat white gold includes a secure friction backing. These delicate bezel and pave set diamond studs boast twenty-four diamonds totalling 0.30 carat. 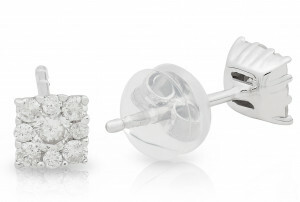 The beautiful stud set in18 karat white gold includes a secure friction backing. 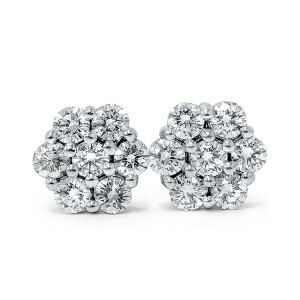 These delicate bezel and pave set diamond studs boast twenty-four diamonds totalling 0.30 carat. 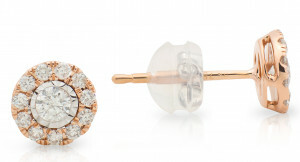 The beautiful stud set in18 karat white and rose gold includes a secure friction backing. These adorable round diamond studs are a must-have featuring two diamond centre setting 0.12 carat and sixteen round diamonds set around the centre stone for a total of 0.31 carats set in 4-prong 18 karat white gold. The pair come complete with comfortable and secure friction backs. 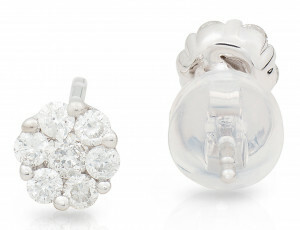 Infuse your look with floral elegance with this pair of flower cluster diamond stud earrings. Each earring features a sparkling bouquet of seven round-cut, Half-carat diamonds to add a touch of glamour to a formal gown or casual cocktail dress. Admire the colourless clarity and exquisite faceting, which accentuate the brilliant cut and delicate angles as the diamonds reflect the light.